A typical cutting process of figures usually requires several mechanized technologies, mainly drill, mill and polish. The NC Cutting & Routing technology has been a well-known process for a long time and is becoming more and more important in the so competitive market nowadays. Among other advantages, the NC cutting & routing becomes necessary when we need to cut very narrow parts, or when obtaining very small radii, or when the height of the part to cut prevents the use of the tool without flexions. For instance, the laser does not wear down and therefore the results are always uniform. The high speed and precision obtained in the results are not to be forgotten these being these some of the advantages of the cutting technology over the standard milling machine. The Fikus NC Cutting & Routing application offers a flexible and functional solution for the present programming necessities, and is not dependent on the age or type of the machine. Fikus for NC Cutting & Routing has been specifically designed to produce cut geometries programs easily and quickly. The product is a Windows 32-bit native application, with dynamic OpenGL rendered graphics, and user interface with clear and concise icons and toolboxes, making the learning process easy. With specific parameter tables and postprocessors. Fikus enables the creation and modification of required geometry, as well as importing geometry from other CAD systems via IGES, DXF or PLT. In addition, it provides an unlimited undo/redo, intelligent trimming, print with preview, as well as specific gear creation functions. The Fikus Cutting Path Manager allows for easy creation of the cutting procedures. This procedure is a combination of geometric and technological data presented in a logical tree, easy to create and edit at any stage in the process. The set of procedures may be saved as a template and applied to other geometries at a later stage. Using this feature, a machining process may be saved and reused. Manipulation of geometries and procedures in the Manager (i.e., create, edit, move, copy or delete) are possible using standard Windows features - copy, cut, paste, drag and drop. Fikus is a complete solution for cutting parts by means of a laser, oxyefuel, waterjet or plasma machine. The cutting options with multiple contours compose the basic system. The technology and stop points are placed graphically and interactively on the screen. The “Destruction “option allows elimination of the roughing processes of those small corners whose direct cut could cause interferences with the nozzle of the machine. It allows, in addition, the pre drilling option and the control of the way in which it will make the cutting movement. During the creation of the part, Fikus allows the user to visualize it as a solid rendered object and dynamically zoom or rotate it using the OpenGL standard graphics incorporated. The changes made by the change of height are automatically visualized on the screen. During the trajectory simulation, Fikus also allows visualization the parts as solid rendered objects and zoom, pan or rotate the scene. Being an application designed specifically as a solution for NC Cutting programming, Fikus helps the user to make the most complex programs easily and quickly. The processes tables and the postprocessors tailored for each machine help to obtain an optimized CNC program made on well-known environments. Fikus automatically detects technological situations like core or cavity, opened or closed parts, reducing the number of user inputs. 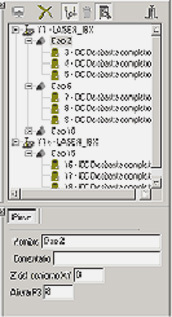 The user must only select the roughing or finishing phases and Fikus sets the necessary parameters automatically and creates the appropriate laser paths. The selection of the contours is made automatically “by window” and Fikus detects islands and open and closed contours. Fikus is a robust, flexible and easy-to-use application designed to reduce overall programming time and ultimately, improve the machining capabilities of the laser, oxyfuel, waterjet or plasma machines.